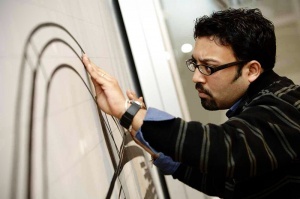 Mr. Bose graduated National Institute of Design in 1998, then he joined Piaggio & C.SpA, Pontedera, Italian Motorcycle Co. as a designer between 1999 and 2001. He was given a scholarship from the INLAKE FOUNDATION to join Royal College of Art, UK between 2001 and 2003. After graduating RCA, he was hired by Daimler Chrysler, Japan till 2007. Real challenge as a designer and manager of Mr. Bose was given by Tata Motor in 2007. He has been promoted to the current position of Head of Design since 2011. A truly interesting Indian Dream. The image of India is a promised but sleeping giant country. It has been considered as an emerging country who will catch up China in the near future. And Tata Motors is a second largest automobile production company in India. What I found from this interview with Mr. Bose is Tata Motors is not an emerging market company unlike most of Chinese car companies. It is truly a global company, not only because they acquired Jaguar Rand-Rover a several years ago, but a philosophy of building global culture is so ambitious. The way Tata is building international design team and recruiting staff from all over the world are nothing different from those of U.S. or European car makers. And I must say that their mentality has already surpassed some of Japanese, Korean, or Chinese car makers.